Masterpiece Theater lives up to its name with the presentation of Shakespeare’s The Merchant of Venice in a production directed by Trevor Nunn and Chris Hunt originally staged in London at the Royal National Theatre. Nunn, an outstanding director who knows how to reach the public (Cats, Les Miserables, and the nine-hour staging of Nicholas Nickleby are among his successes) and Hunt have crafted a streamlined version of one of Shakespeare’s "difficult" plays. They have given the play an immediacy and relevancy that put its anti-Semitic qualities in a new light. Making the story taut by eliminating extraneous detail, the directors have pared the play to the bone, keeping the well-known lines and speeches. By setting the action in the 1930s, so that the anti-Semitic issue is seen from the perspective of Europe on the brink of nazism, they enable a new interpretation of the play. The resolution, in which the Jewish merchant Shylock is forced to forfeit his wealth and become a Christian, categorized the play in its time as a "comedy" because the outcome was a "happy ending." This production is not a distasteful display of the attitudes of Shakespeare�s time but instead becomes a harbinger of horrors to come due to those anti-Semitic tendencies. Nunn admits that a few scenes, notably at the very end, have been transposed to strengthen the effect. He has sought to find Shakespeare the humanist in this play and he succeeds. For those unfamiliar with the play, this is a compelling introduction. 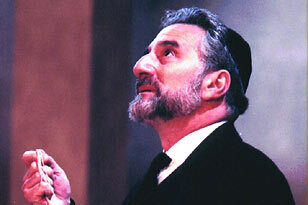 The acting ensemble is uniformly strong, led by Henry Goodman as Shylock. He is dressed and speaks like a Hassidic man. His hatred of Christians is motivated by the way they treat him. The emotional color with which he invests his lines helps us understand this man, who is forced to show mercy where none is given him. The way he speaks the line "This pound of flesh is dearly bought" demonstrates his inner conflict with great power. As Antonio, the man who agrees to repay a substantial debt to Shylock with a pound of his own flesh if he is unable to return the money borrowed, David Bamber exudes scorn and condescension. Antonio believes he is morally superior to all others and deserves to be excused for his failings. The directors have also given him a homosexual sub-text, which he plays with discretion. It is a detail that adds to the atmosphere of decadence, also conveyed in the nightclub scenes, which are straight out of Cabaret. Antonio goes into debt to Shylock to help his friend Bassanio (Antonio’s implied lover) woo the wealthy Portia, a woman who seeks a husband. Alexander Hanson is believable as Bassanio, a man who is possibly bi-sexual. Portia is arguably the most complex character in this drama, and is very effectively portrayed by Derbhle Crotty. Not only is she Portia the wealthy heiress, but she also assumes the disguise of a lawyer to go in aid of Antonio. When Antonio is unable to repay Shylock, a court of justice is called to decide Antonio’s fate. Should he forfeit the pound of flesh to which he agreed in his bond with Shylock? As the lawyer, Portia is relentless in her pursuit of justice. She turns the tables on Shylock, who at first thought this lawyer to be his advocate, his Daniel. The turning point of the drama occurs when Shylock commands the lawyer, whom he thinks is his advocate, to carry out the law. He thus seals his own fate. Portia successfully interprets the law very narrowly and leads to the sentence that brings about Shylock’s undoing. There is a troubling aspect of Portia that is changed in this production. Portia’s late father constructed a puzzle: her suitors must unlock one of three caskets to find out if she will be theirs. Although she is pursued by many wealthy men, she hopes that Bassanio will become her husband by choosing the correct casket–and he does. She gives him a ring and has him swear an oath that he will never remove the ring. At the urging of Antonio, Bassanio ultimately gives the ring away to the lawyer (Portia in disguise) as a reward for having saved Antonio’s life. Portia reveals Bassanio’s transgression, and admonishes him for his failing. In the play’s ending, Portia seems to overlook Bassanio’s failing and make light of it. This side of Portia’s character has been eliminated. The production is handsomely mounted (production design by Hilda Bechtler) and effectively filmed. The camera watches closely–we are there, near the action. Nunn and Hunt have made this play accessible, even acceptable where it had become untouchable.